• Variations of the holiday are celebrated from February to April. • The gift-giving starts on February 14th, when it’s up to women to woo their men with chocolates, candies and flowers. • The tables turn on March 14th, known as White Day, when men not only shower their sweethearts with chocolates and flowers, but up the ante with a gift. Mumbai, 3 February, 2017: Valentine’s Day, the most romantic day in the year is around the corner. And while love is a universal emotion, it is expressed differently in different parts of the world. Zindagi is the only channel in India to showcase universal emotions and introduce new cultures to Indian audiences by bringing the best storytelling from across the globe to viewers in Hindi. To encourage its viewers to celebrate the month of love, Zindagi, the No. 1 Premium Entertainment Channel, brings to you the most successful romantic story from South Korea, ‘Descendants of the Sun’ starting 8th February at 8 PM. 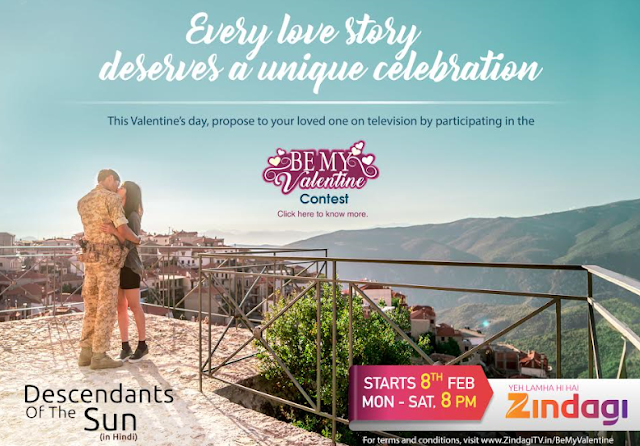 Zindagi also announces the ‘Be My Valentine Contest’, where viewers will get a chance to profess their love to their loved ones as part of the Valentine’s Day celebrations.